UPDATE: Congratulations to Erin W. on winning the Mattel Game On! prize pack. Erin has been notified by e-mail. Thanks to all who entered! One of my favourite parts of summertime camping is evenings spent huddled around the picnic table, shuffling card decks and challenging each other to board games by lamp light. This is the kind of stuff epic memories are made of, so you can imagine my delight when a Game On! box arrived from Mattel last week. 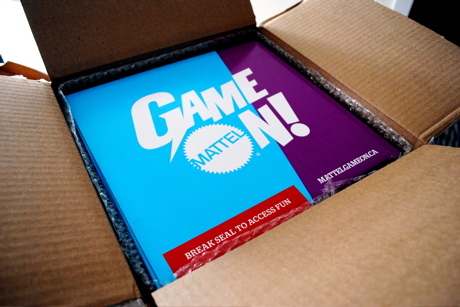 I want to give this entire Mattel Game On! prize pack to one lucky reader. You’ve got three chances to win! I will draw the lucky winner on Monday, August 22nd at noon. Good luck! Keira-Anne.com contest winners from within the last six months are not eligible to win. Winner must reside within BC; the prize will not be shipped elsewhere. Sitting on the deck at the cabin on Hornby Island (over looking water of course) and playing Crib! Lately I’ve been loving Bananagrams. You’ll lose an entire ferry ride playing it! Of course, I like any game I win regularly! I have probably the only surviving copy of a limited run of Vancouveropoly. Best. Board Game Marketing. Evah! I remember the days of Monopoly. Me and my sister used to play this game ALL THE TIME..it is actually the one memory that I have that really stands out, mostly because I always got to be the banker and I was always the one cleaning up the game. Once I got older, Chess with my dad, Go Fish with my mom, and I am pretty sure, that if I dusted off our old Monopoly Game, I would be the banker and I would end up cleaning it up. Having Yahtzee tournaments at our cabin on One Island Lake in Northern B.C.! Having a game of softball with all my friends! 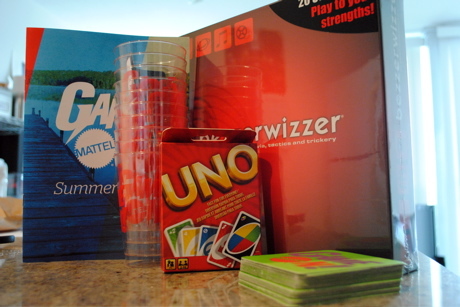 My favourite summertime game is Cribbage! but for group board-game sessions, definitely Cranium. Too much fun! pictionary is the best summer game! sooo much fun! When we were little, we used to go to a cabin in Ontario called Trout Lake. All our cousins would come and we would sit on the dock and play Cribbage. The loser had to jump off the dock! Travel Scrabble with my Dad on Hornby, or Apples to Apples with a bigger group. Hours upon hours of Uno!! You can’t beat Bohnanza – the bean game … 4 player is best I think. Catan, til the end of time. We play monopoly under the stars! My favourite summertime game … trying not to get bitten by the mosquitoes. I think I’d have to say jigsaw puzzles! My favourite summertime game is Scrabble.